Creator Direct: Easel, Samba and Magazines. I bought an easel on eBay last week and it showed up yesterday. It's a great addition to the studio since I've been trying to do some painting and fighting with various cheap flimsy easel set-ups. 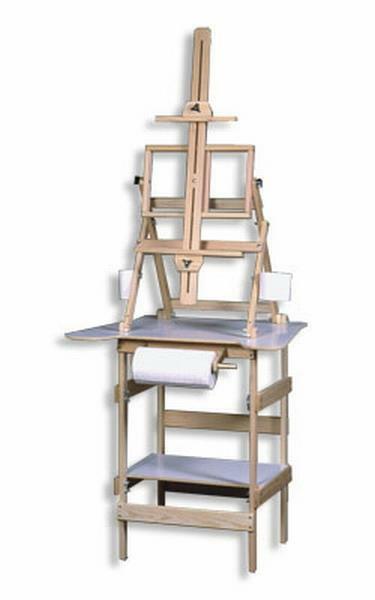 This one has a nice paper towel holder, a few brush buckets and a great rack for holding the canvas or drawing board. 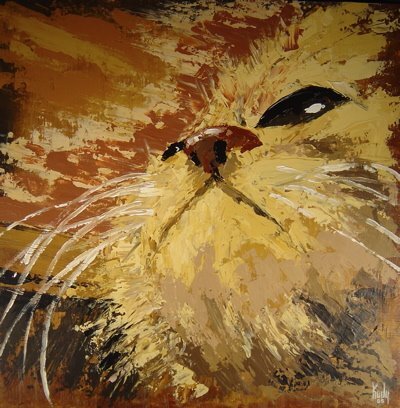 I'll post some paintings now and then to show some progress, but mostly I just wanted to be able to do some experimenting and make a few pieces for my gallery wall space I rent at a local arts market. Here's a piece I did a while back using nothing but a spatula just to see if I could do it. Came out pretty good and it sold for a few hundred dollars. This is one of my cats, Samba. I'm real close to finishing my caricature illustration portfolio to send out to the magazines. Some of you may remember the Howard Stern caricature I posted when the Blog first started, I'm doing a few more in that style and hopefully I'll get some hits from the mags. I'll post those as soon as they're colored.